It’s holiday party time, and many people get stuck eating the same, sad appetizers and finger-foods. Crackers and cheese, crudités and dips, and lots of sweets. Why not spice up your appetizers with something simple and (gasp!) healthy? 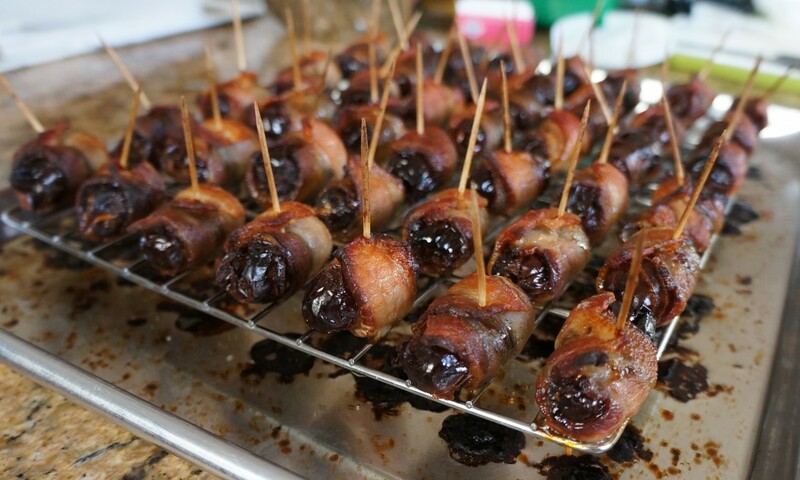 Bacon-wrapped dates to the rescue! 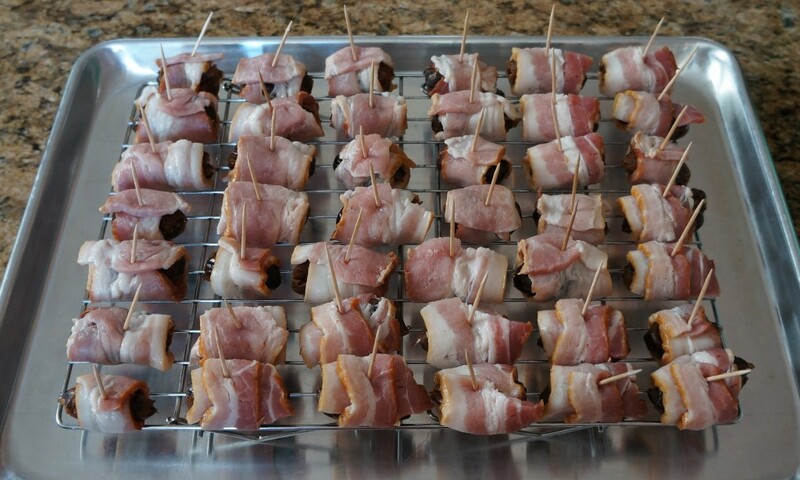 Yes, I am actually asserting that bacon and dates are healthy foods, especially as an occasional treat. But no one will think so once they have tasted these little beauties! First, let’s address the bacon. Bacon is delicious, true, but it is also a nice balance of protein and fat packaged with a good amount of Vitamin A, Niacin, Selenium, and Phosphorus that lends itself nicely to all sorts of culinary applications. If the bacon comes from a good source (pastured or sustainably raised pigs, organic), it will provide delicious nourishment, not be the artery-clogging, health-destroying villain as you have been led to believe. 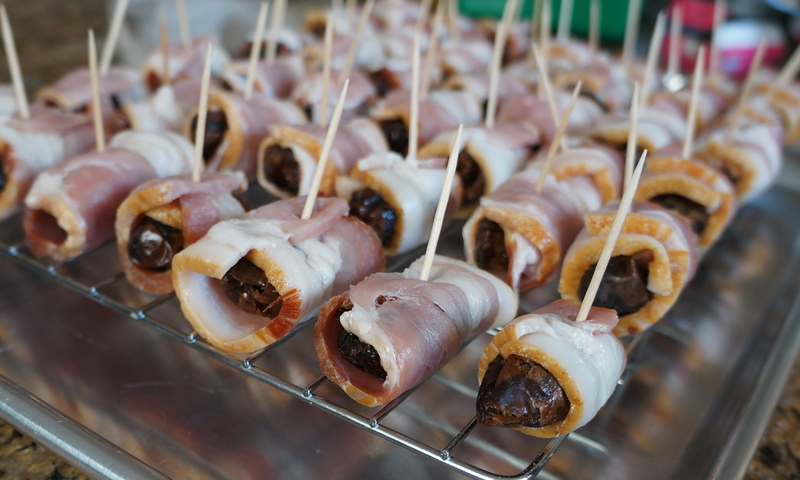 Including bacon in this appetizer adds salty flavor which balances out the sweetness of the dates, and the protein and fat help keep blood sugar stable and satiate you so that you don’t keep eating the fried oreos (or some other nonsense). 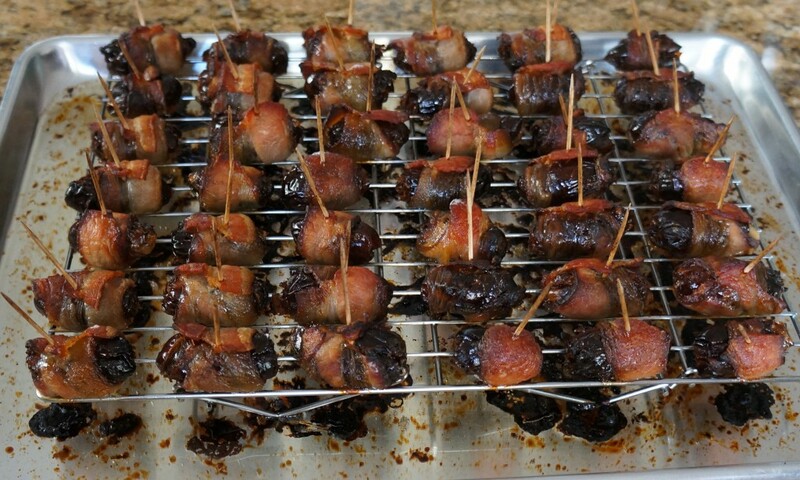 See this recipe and this one for two of my favorite dishes with bacon. The dates, a sweet fruit, are full of fiber, Potassium, Magnesium, Manganese, and many B vitamins in addition to their natural sugars, and though they are very sweet, they are still a whole, real food that is as unprocessed as a fresh orange. 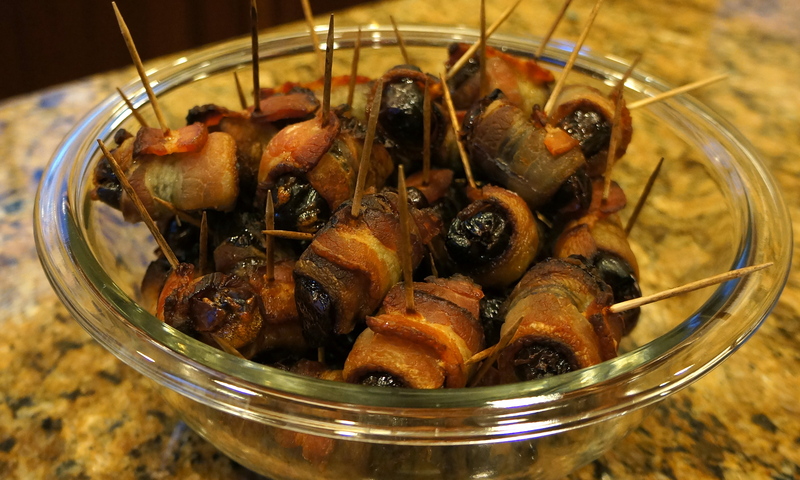 It is that natural sweetness and their soft texture that pairs perfectly with the savory, crispy bacon. Since then, B and I have made and served these at several parties, always to rave reviews (and usually resulting in an empty serving tray). My mother-in-law even asked me to make some for a party she had last weekend, and they were a hit! 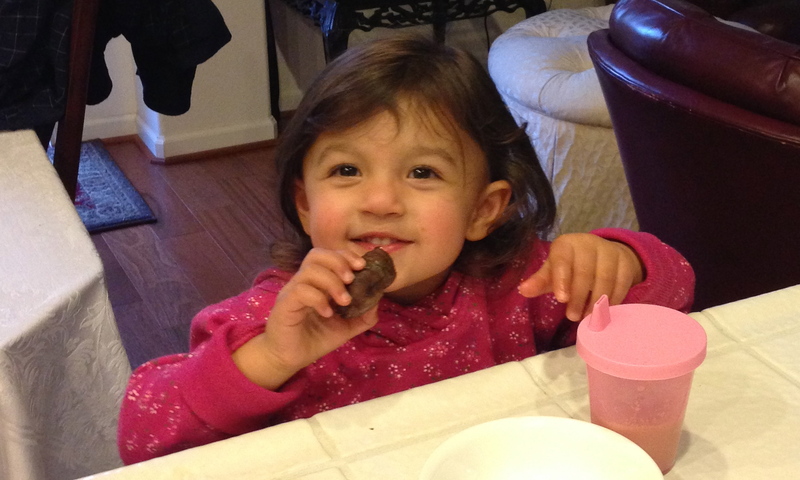 I also like that bacon-wrapped dates are a treat that my kids love, and I can feel good about allowing them to eat as many as they want. However, this time I had to tell H that she couldn’t have any more only because I wanted to make sure there were enough for the other party guests. I guess I need to make more next time! Remove the pits from the dates. You can use a paring knife or your fingers to partially split the date and then dig out the pit. Cut the bacon strips into thirds. Line a baking sheet with aluminum foil and a cooling rack (if you have one). Wrap one of the bacon thirds around a date, securing it with a toothpick. I like to stick the toothpick through the center of the date so it can be used as a handle for later eating. Place the wrapped date on the cooling rack. Repeat until all the dates are wrapped. Baking option #1: Place the baking sheet in the oven and turn it on to 400F. When the oven reaches 400F, check the dates every few minutes until the bacon is cooked to your desired consistency (I like them pretty crispy). Baking option #2: Preheat the oven to 350F. When the oven is hot, place the baking sheet in the oven and cook for about 25 minutes and then check for doneness. After that, check the dates every few minutes until the bacon is cooked to your desired consistency (I like them pretty crispy). 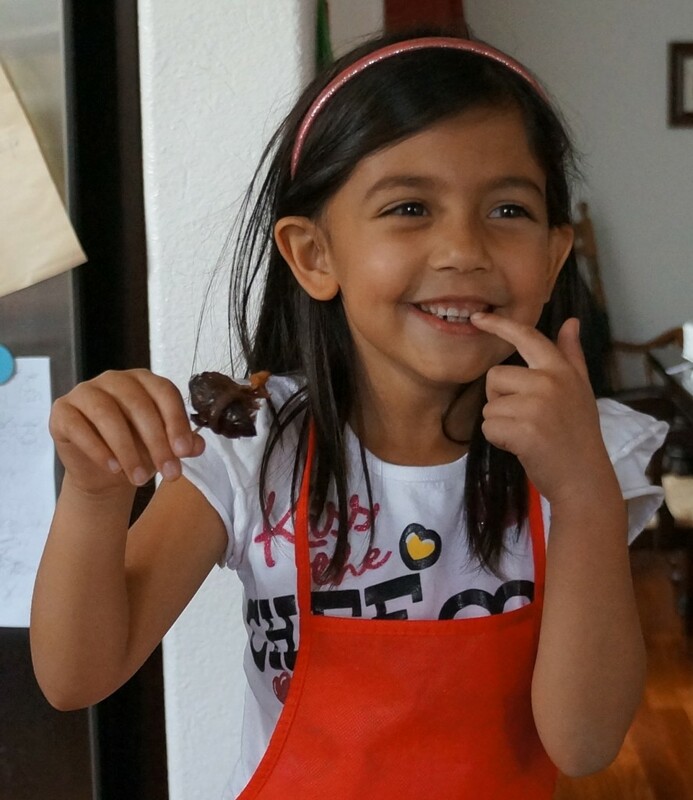 My kitchen helper and taste tester! 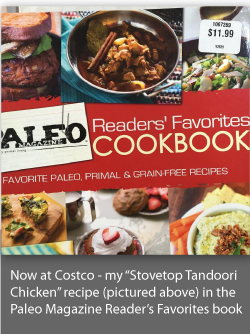 This post is linked to Tasty Traditions, Monday Mania, and Real Food Wednesday.